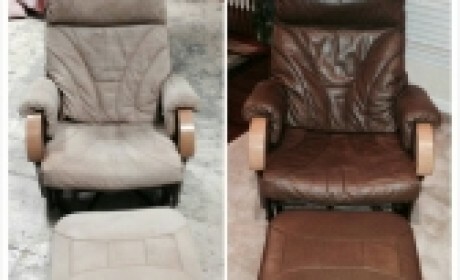 We specialize in a on-site same day service for most leather restoration jobs. We use special formulated products, that are environmentally friendly. With our leather refinishing process we bring the leather back to life. We have the ability to repair tears, cracks, or hand stitch seams on-site, even replace certain panels with a genuine leather or vinyl. Our innovative products and techniques will leave your leather looking soft and supple while still keeping the natural look and feel it once had. In most cases, tears in leathers or vinyls can be repaired. If it is beyond repairable we have the ability to replace the damaged areas and refinish the rest so we can keep the cost down while making your items look like new. The special bonders in our formulas contain elements that naturally bonds the damaged areas on the leather, providing the most natural look. We actually build back the damaged area, similar to how our skin heals. This method deminshes the appearance of “scars”, while promoting strength that will last for years. This process doesn’t make the damaged area hard, it acts as a artificial protective layer, your leather is then custom matched and refinished. We follow over the finish with a protective sealer to ensure the longevity. Anilin leather Is the most natural looking, with natural surface visible, but is less resistant to soiling. Semi-Aniline leather Is a natural looking leather with a light glazing or clear coat on top for durability, that way your still able to see the natural beauty of the leather. Pigmented (protected) leather Is the most durable but is less natural in appearance, having a top coating.